Since really getting into makeup I've spent endless hours searching the internet for tidy dressing table solutions in hope of ridding myself of my messy habits that always leave my makeup collection looking like it's been ambushed! I know I'm not alone in keeping my makeup table tidy without tidying up every time I apply makeup. Especially when I leave getting ready until the last minute or have somewhere to be. It just seems impossible! However, I finally think I've come up with an answer for all the women that possess enough foundation to last them a lifetime and an endless array of lipsticks. Read on to find my #1 solution for a tidy dressing table every time you apply makeup! Now I'm going to assume that if you own a large amount of makeup (i.e your makeup collection doesn't fit into a single makeup bag) then you have some kind of setup on your desk. It could be acrylic drawer (my personal favourite way of storing makeup), plastic or cardboard crates/boxes or maybe even a drawer tower. However the problem is even with storage solutions in place once you start to apply makeup it's going to be out all over your vanity table unless you place everything back in its rightful place after you have used it... which let's face it, we don't seem to have time for! If you haven't got at least one storage solution in place then I firstly recommend you do! It will make everything much more organised so you know where everything is when you come to use products in your collection. 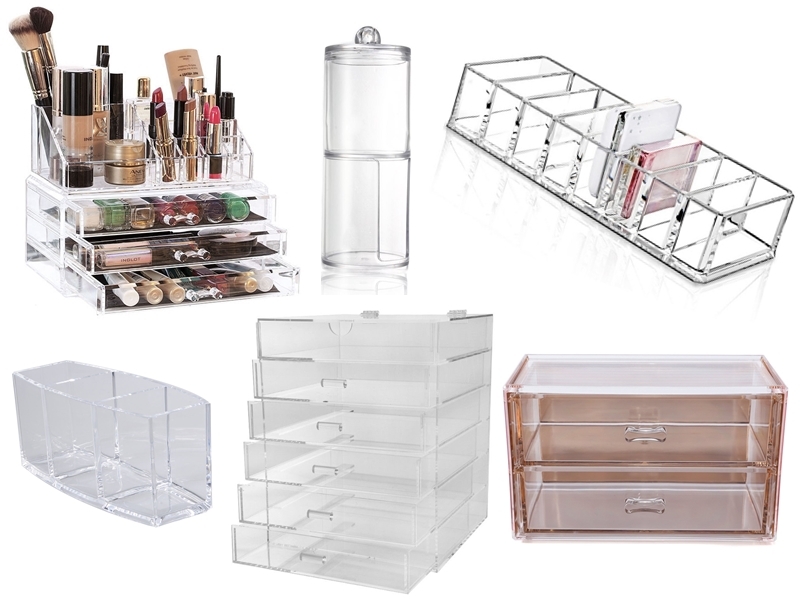 Above are some of my favourite inexpensive makeup storage which I recommend over Muji Acrylic Drawers - because they are virtually the same but without the hefty price. Anyway, to my #1 solution for a tidy dressing table that has been working for me perfectly and for that reason I wanted to recommend. Now it's nothing groundbreaking but it works! Are you ready? Invest in a Vanity Case. Yes, that is it! Okay, so it's not really an investment because you can pick one up for £10-30 and it's not as simple as throwing all of your makeup into it, however that is all you need, along with your existing setup. As I had a lovely rose gold vanity (this one here) that was sat collecting dust I decided to make use of it filling it with my most used everyday makeup. However, I decided that as I like an array of eyeshadow palettes and lipsticks that I would exclude them from my vanity case and just select whatever I wanted to use from my dressing table storage. I then arranged my vanity case by product type and loosely in order of how I apply them. So as you can see I decided to go from bottom to top with primers and foundations at the bottom of the case (this also works well because they are the bulkier items) then in the left set of tiers I placed brow products, mascara, eyeliner and concealer as I apply my makeup in that order and then the right tiers containing finishing powder, bronzer, blush and my go-to lip balm. Then when it comes to applying my makeup I simply open up my vanity case and use the product, placing them back in as I go. This is much simpler than opening and closing drawers as the vanity case can be open right next to you. Once I'm done I simply close the vanity case and store it under my dressing table out of sight. It really is as simple as that! 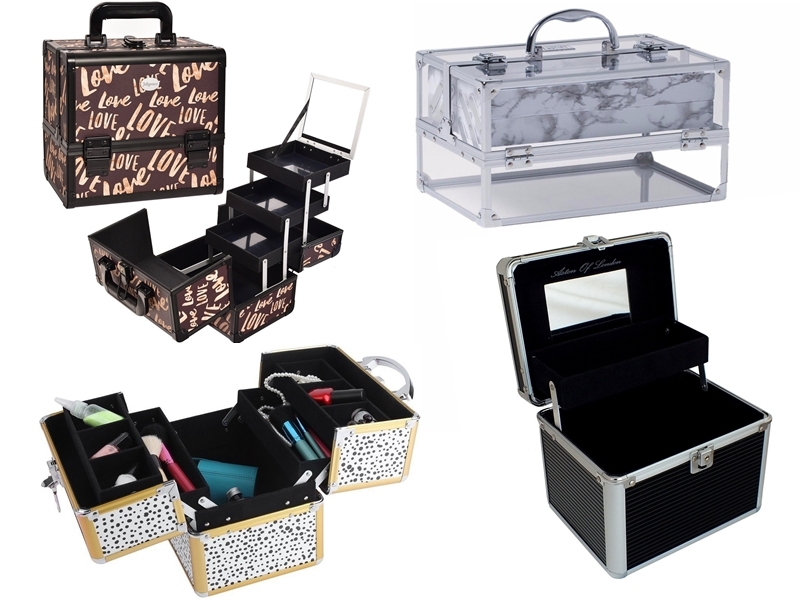 Of course, if you are someone that likes to try new makeup you may want to have a weekly re-stock/change of the makeup in your vanity case so that it doesn't get disorganised but other than that this solution is perfect for a mess-free makeup desk or wherever you sit and apply makeup! Above you can find the vanity case I use, which I love, along with a few other budget finds if you want to give this storage idea a go. A simple idea but one that really is effective!